This Hearty Casserole Puts A Fun Spin On A Classic Dish! Traditionally, chicken parmesan consists of breaded and fried chicken cutlets that are smothered in marinara sauce and mozzarella cheese and then served on a heaping pile of pasta; we love the classic dish as much as the next person, but wanted to see if we could take all those flavors and transform them into something a little bit different. Lightening things up a tad, we omitted the pasta from our chicken parm casserole and instead added garlic croutons…and what a good decision that was! The croutons are perfectly buttery and full of flavor, and then they absorb all the other yummy stuff we layered on top, so you get a little bit of crunch to go along with your tomato sauce-covered, cheesy, chicken goodness – what’s not to love about that?! Evenly spread out garlic croutons in the baking dish, then cover with cubed chicken. Season chicken with garlic powder, red pepper flakes, salt and pepper, and sprinkle chopped basil over the top. Cover chicken and croutons with marinara sauce, then top with cheeses. 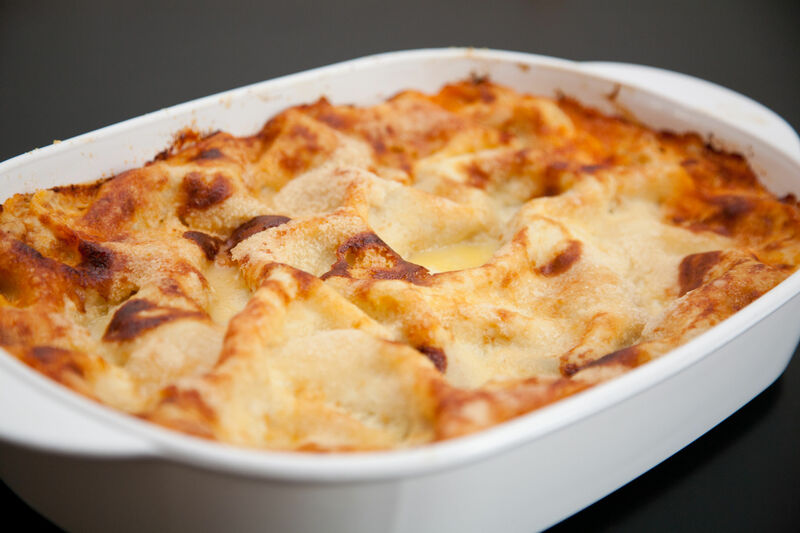 Place baking dish in oven and bake for 20-25 minutes, or until cheese is melted and bubbly. Remove from oven and let cool 5 minutes before serving.